President Barack Obama and ballerina Misty Copeland sat down with TIME reporter Maya Rhodan on Feb. 29 for a conversation about race, gender and success in the White House Cabinet room. TIME: Well thank you both so much for joining us today. My hope is that this is more of a conversation than an interview. So we’ll just let you guys talk. I’m going to be obviously jumping in with questions. But we want it to be natural and fun. And I want to start off by saying that you guys have a lot more in common than I’m sure a lot of people know. You’re both born into multiracial families, you were raised by single mothers. And you’ve risen to the top of your respective fields as African Americans. Which is pretty notable. But I’m curious, what do you see in each other that you recognize in yourself? Like what is it, and is there a common thread that has allowed you both to succeed? MISTY COPELAND: That’s not the common thread. You know, as the father of two daughters, one of the things I’m always looking for are strong women who are out there who are breaking barriers and doing great stuff. And Misty’s a great example of that. Somebody who has entered a field that’s very competitive, where the assumptions are that she may not belong. And through sheer force of will and determination and incredible talent and hard work she was able to arrive at the pinnacle of her field. And that’s exciting. The other thing is, as a father of two daughters, seeing how images of strong athletic accomplished women carry over, and encouraging them in sports and dance and how they move physically, it turns out that every study shows that young girls who are involved in sports, dance, athletics end up having more confidence generally. And across the board in everything that they do end up being more assertive, happier. So this is one of the reasons why having Misty on our Fitness Council has been so important. COPELAND: I think that there is a sense of humbleness and humility, and there’s a human that’s within you. And I think that that’s something that I can relate to and connect with that people are drawn to. And they feel this genuineness coming from you. And I think that it allows you to rise to this level, and not feel this pressure that’s kind of pushing you down, but allows you to take the responsibility with a sense of pride. And again just being grounded. And I feel like as I’m embarking on my first season as a principal dancer I’m experiencing something that I didn’t prepare myself for, I think emotionally and mentally and psychologically. When you have all of these expectations and goals to reach this point that 1% get to, you know how do you – what do you do when you get there? How do you stay grounded and humble and striving? And I think that’s on a much smaller scale for me, but something that I feel I can relate to with you that I can’t imagine you must have experienced. OBAMA: Yeah. It’s like what, suddenly you’re some prima ballerina? Please. I remember when – and they’ll remind you of some story. Okay. That’s helpful. 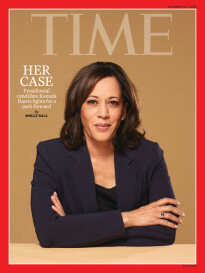 TIME: And you both represent the African American community. As the President of the United States, as a principal dancer for the American Ballet Theater, do you ever think that – how does race come to play? Do you think that people still treat you differently because of race? Because you’re African American? COPELAND: You know, my experience has been that a lot of what I’ve experienced has not always been to my face, or it’s been very subtle. But it’s in a way that I know what’s going on and I feel it deep inside of me. And I, being the only African American in almost every environment in terms of classical ballet, it weighs on you and it wears on you after a while. And I feel like a lot of it as well is what I’m kind of putting on myself. And this just trying to not get too caught up and too wrapped up and too weighed down with being black and trying to just be the best person and the best dancer that I can be. And work, and work harder than, even if I see the person next to me that things may be a little bit easier for them, I’m going to try and push myself even harder than them. But I think that being African American has definitely been a huge obstacle for me. But it’s also allowed me to have this fire inside of me that I don’t know if I would have or have had if I weren’t in this field. OBAMA: Well part of classical ballet that makes it challenging is that there’s a very set way of doing things. There’s sort of this canon that people want it just a certain way, or they want it to look a certain way. So do you find now that you’re in a position where you can start pushing the barriers a little bit and the boundaries in terms of what people expect? Now that you’ve established that alright, I can do this, so let me also do that. Or I can master that style, and so now can we introduce something a little bit different? How much of that takes place? COPELAND: Absolutely. I mean I think that having a platform and having a voice to be seen by people beyond the classical ballet world has really been my power I feel. It’s allowed me to say, it’s okay to have a healthy athletic body. We are fully capable of doing everything that the person who doesn’t have an extremely athletic body, that is more thin. We’re fully capable of doing exactly the same thing. And I think that being in this position and showing that I can execute and do all of these things that it’s possible to have any skin complexion, to have a healthy body image for the ballerina body. I think it’s given me more of a voice. And it’s I think forcing a lot of these top tier companies to address the lack of diversity and diversifying the bodies that we’re seeing in classical ballet. It’s really forcing that conversation to be had. OBAMA: I have to say as an outside, I don’t know if you feel the same way. When I hear that like your body type is considered sort of more athletic or large, you’re tiny. For those of you who are watching, you may not be able to see. I mean, you’re petite. OBAMA: So the notion that somehow that was even a question is pretty interesting. COPELAND: Yeah, I mean I think it’s how – I think it’s a lot of the language and how we use it. And I think for a lot of people of color, that seems to be an easy way or a way out by saying you don’t fit in. It may be it’s your skin color. It may be the texture of your hair. Whatever it is. OBAMA: We want a certain look. COPELAND: Yeah. And I think that’s an easy way of addressing that. TIME: As a father of two daughters, do you see that at all? Do you see that pressure in your own life? OBAMA: Yeah. I mean some of this is just gender issues, generally. I mean when you’re a dad of two daughters you notice more. When I was a kid I didn’t realize as much, or maybe it was even a part of which is the enormous pressure that young women are placed under in terms of looking a certain way.And being cute in a certain way. And are you wearing the right clothes? And is your hair done the right way. And that pressure I think is historically always been harder on African American women than just about any other women. But it’s part and parcel of a broader way in which we socialize and press women to constantly doubt themselves or define themselves in terms of a certain appearance. And so Michelle and I are always guarding against that. And the fact that they’ve got a tall gorgeous mom who has some curves, and that their father appreciates, I think is helpful. I do think that culture’s changing for the younger generation a little bit more. You see Beyonce or you see some of these pop stars and what both white, Latino, black children are seeing as representative of beauty is much broader than it was when I was a kid. You just didn’t see that much representation. And that’s healthy and that’s encouraging. But it’s still a challenge. I mean Malia’ll talk about black girl’s hair and will have much opinions of that. And she’s pretty opinionated about the fact that it costs a lot, it takes a long time, that sometimes girls can be just as tough on each other about how they’re supposed to look. And so it’s, as a parent, that’s a constant learning process that you’re trying to hold the fort. And that’s why somebody like Misty ends up being so important. A lot of it is the power of that image, even if they’re not dancers, even if they’re not interested in pursuing a career in entertainment or the arts. For them to know that that’s valued end up making a big difference. TIME: And beyond the just simply being there, that obviously makes a difference. But then there’s also a pressure like you mentioned to do more. And I’m curious also what you make of social movements like Black Girl Magic, when there’s like these grassroots level reinforcement of these ideas that black is beautiful, in a sense? COPELAND: It’s so important for this generation. And to use social media to have a positive impact on our generation is huge. And I know that you have a presence as well. And it’s such a part – I think we have to be involved I think in order to really reach the younger generation on social media. But to have movements like Black Girl Magic, I think it couldn’t be more positive for a young black girl to see that it’s okay to be yourself, it’s okay to not have to transform and look like what you may see on the cover of a lot of magazines. That you are beautiful, that it’s possible to succeed in any field that you want to, looking the way that you do. With your hair the way it is. I think all of that is so extremely important and something that I’m constantly celebrating. That something that I fought so hard for throughout the beginning of my career is I didn’t want to pancake my skin a lighter color to fit into the … ballet. I wanted to be myself. I didn’t want to have to wear makeup that made my nose look thinner. There are just – it’s important I think with this generation of young minorities, children especially, to feel comfortable and confident in their skin. OBAMA: Well social media obviously is the way in which young people are receiving information in general. So the power of young activists to help shape color and politics through things like Black Lives Matter, which I think is hugely important. And when I think about the journey I’ve traveled, there’s no doubt that young African America, Latino, Asian, LGBT youth, they have more role models. They have more folks that they can immediately identify with. And that, in and of itself is of value. But what we also have to remember is that the barriers that exist for them to pursue their dreams are deep and structural. And so it is wonderful that the potential dancer can see Misty and say, I can do that. But if there’s no dance studio at all in their neighborhood, and if their schools don’t offer any extracurricular activities at all, or if their school is chronically underfunded, then it’s going to be a problem. I hope that there are young men of color who are looking at me and saying, I can aspire to be the president, or a senator, or a community organizer and make change in my neighborhoods. But if they are locked out of opportunity, and in neighborhoods where even if I’m on television, there are no men in their neighborhoods who’ve got jobs that are able to support a family, then you’ve still got problems. So I think culture, changing attitudes is hugely important. You know we’re for example trying to get more girls and women to study the stem subjects, math, science, engineering. Because they’re chronically under-represented. And in researching this we found out that for example, since CSI came on, and there are women who are doing forensic investigations, that the number of women who are in this field has skyrocketed, right. So some of it is just okay, I now picture myself as doing that. But I think it’s important for us to remember that it’s not just a matter of providing us a strong image, it’s also making sure that they’ve got good schools, making sure that they’re getting programs that allow them to explore all their talents. Making sure that the economy is working in a way that gives everybody a chance to succeed. It’s a both and rather than an either or proposition. TIME: Well how do you make sure those things are protected when you see, for example Affirmative Action in the balance again? Is that something that’s important in academics and the arts for example? OBAMA: Well I – look, I’m a strong supporter of Affirmative Action as a way of opening more doors. And I think there are ways of structuring Affirmative Action so that everybody’s getting more of a chance. And the truth of the matter is, there’s always been Affirmative Action, it just hasn’t always been minority focused, right. If you make a big donation to a university, your kid is more likely to get into the university. It’s not called Affirmative Action, it’s called legacies. And so for a school, for a dance program, for a political organization to say we’re going to actively seek out and recruit talent that hasn’t had insight into this field before, this world before. We’re going to have a bunch of young girls come into American Ballet Theater and just watch, and get a workshop, and have them imagine themselves on that stage. You know, because they’re much less likely to have a program available to them in their community or to have parents who even know about ballet. Well, that’s something that’s extraordinarily valuable. And I think we can sustain, while not being so rigid that it ends up locking anybody else out of an opportunity. COPELAND: I absolutely agree. I mean I think it’s so completely necessary. Especially when you’re dealing with a field that’s never really been open to reaching out to communities that don’t have the access, that don’t have the exposure and the means to be a part of something especially that’s so niche as the classical ballet world. And I think that it’s a responsibility that I feel. You know, being the only African American at this level in American Ballet Theater, I feel like people are looking at me, and it’s my responsibility for me to do whatever I can to provide these opportunities in communities to be able to educate them. And if that means having a program just for black dancers to allow them to have the same opportunity that generations and generations of white dancers have had, it’s necessary. OBAMA: Yeah, this is one of the reasons why I’ve got something called My Brother’s Keeper that we’ve been mobilizing all across the country. And the notion is, if we can reach young men of color, who so often are channeled into destructive behavior or into dropping out of school and ending up in the prison pipeline. If we can just expose them to what their possibilities are, link them with a mentor, work with the institutions like schools to say, examine what your policies are on suspensions and expulsions to make sure that black boys or Hispanic boys aren’t being treated differently. What you do is to – what you discover through this process is how much talent is there untapped. And we bring in some mentees to the White House each year. And I have lunch with them and we pair them up with senior advisors. And a lot of them have never even been into an office setting before. A lot of them don’t know what it means to be a secret service agent. Or what would be required for them to pursue a professional degree. And we’ve been doing this for a few years now, and we’re already seeing how the horizons that these young men suddenly have for themselves starts rising. And the great thing is we’ve been able to duplicate this in hundreds of cities across the country. You’re seeing companies step up saying we’re willing to bring in somebody for the summer so that they can get exposed to what a law firm looks like, or what an accounting firm looks like. And that then provides the motivation for these young people to navigate and take – make better choices in their own lives. Because ultimately, I’m sure Misty feels this, I certainly feel it, we wouldn’t have succeeded if we hadn’t worked hard. You can’t replace hard work and initiative and discipline and sacrifice, and delayed gratification. There are all kinds of things you give up along whatever path to success you’ve chosen. But part of what inspires you to make those sacrifices is the sense that I might actually succeed, you know. And so much of what we want to do with our young people is persuade them to dream big, and to not feel that somehow their circumstances at birth, or the circumstances of their upbringing or poverty or race in any way inhibits them. You have to be honest with them and say yeah, it’s going to be harder for you than it might have been for somebody else. But that’s okay. It turns out that kids are extraordinarily resilient if they feel like they can actually make something happen. TIME: Looking back, was there anything that someone told either of you about race, or didn’t tell you about race that you wish they had or that you feel like you had to learn on your own? And how does that impact how you talk to young people today? COPELAND: I feel like my mom pretty much covered everything with me. Being biracial she made it very clear to me that yes, you’re Italian and you’re German and you are black, but you are going to be viewed by the world and by society as a black woman and you should be prepared for that. I think that I, being very shy going into a setting where I was the only black woman, allowed me to observe more, rather than react. And I think that saved me a lot. And it taught me a lot. And it has allowed me to, when I’m interacting with my mentees to say to them, you know, there are just ways that you have to approach situations that may be difficult or may not be fair, but it’s how you represent yourself. You may be carrying a responsibility that you don’t want, but it is what it is being African American and being in certain environments. It doesn’t matter if you’re a ballet dancer, if you’re an attorney, whatever it is you’re trying to do, you’re going to be faced with these obstacles. OBAMA: You know, I mean I think about this now as a parent. Michelle and I are having a lot of conversations around the dinner table. And for me, what I always try to transmit to my kids is that issues of race, discrimination, tragic history of slavery and Jim Crow, all those things are real. And you have to understand them and you have to be knowledgeable about them. And recognize that they didn’t stop overnight. Certainly not just when I was elected. I remember people talking about how somehow this was going to solve all our racial problems. I wasn’t one of those who subscribed to that notion. And, but what I want them to draw from it is a sense of justice for everybody. My view is that the strength of having been a minority on the receiving end of discrimination is that it should make you that much more attuned and empathetic towards anybody who’s vulnerable. Towards anybody who’s being locked out. So what I say to my kids is use this as something that provides you a particular power to be willing to fight on behalf of what you think is right. And that includes thinking about and being concerned with the struggles that whites have in this society as well. You know part of what I think is sometimes difficult, but I think absolutely necessary for black activists like those who are engaging in some of the protests around Ferguson etc., is to try to also get yourself in the mindset of a police officer who is scared. And who is trying to figure out how to navigate a really challenging job and wants to get home safe. And may make a split second decision. And how are they being trained? And are they being provided enough guidance from their bosses that will steer them in a better direction than the worst direction? That’s hard to do because it’s easier to just kind of say, be angry and frustrated. And part of what I think successful social movements have involved is having a certain righteous anger about injustices being done to you, but also understanding that people who are on the other side of this, they’ve got their own history and their own circumstances. And you have to understand that, and you have to recognize that each of us has some good and some bad in is. And that’s not an excuse, but what it does do is it gives us an opportunity then to have a conversation and to reach across the divide. And that’s not something that always, at a time when so much of communications is sound bytes and tweets, cable news, it’s hard to have that kind of conversation. It’s easier I think to just make everything very black and white. But I think that when you look at how social changes happened throughout history, including in our country, it’s been because we can project ourselves into the circumstances of other people. And hopefully that’s something that Malia and Sasha and her generation is picking up on. And I think they have. TIME: And wrapping things up. What do you see as the single greatest fixable obstacle to the success of young people today? COPELAND: The single, wow. I think – I mean everything that you were saying, being able to have an understanding of yourself and how you fit into society and who you are. But to be empathetic to everyone around you I think is such a powerful thing to hold. To be able to forgive. All of those things I think can strengthen this generation of our youth. I think having a strong sense of self and just knowing who they are and being comfortable with that. OBAMA: Well, you know, I spend most of my time thinking about institutions. And there’s no doubt, even though it’s a cliché that the single biggest difference we can make is making sure that our kids get a good education. We can do a lot to keep the economy moving forward, we can do a lot to make sure that we’re enforcing our nondiscrimination laws. We can do a lot more to open up people’s perspective about who belongs where. And press to make sure that we have more women CEOs, and more African American film directors. And more Latino police officers. And all those things are important. But the foundation that all this depends is making sure that on the front end, when these little babies are born and start to get curious about the world and are like sponges, that we are giving them the kind of education and the nurturing that they need. So that they’re off to a good start. And that involves an imaginative leap, a moral leap on the part of the society as a whole that says every kid should get a genuine opportunity and we’re willing to put money behind it, and we’re willing to invest in that to break cycles of poverty. And to reach out and pull kids up, even if they aren’t born into the best of circumstances. And that’s hard to do. Because we’re working off of a legacy of hundreds of years of discrimination that gets passed on generationally. If we could decide tomorrow that there was no discrimination, that we had some new drug that everybody took and suddenly nobody would be racially prejudiced. We still have a whole bunch of really poor kids who need help. And that still requires us making investments in them. And that means that all of us, the government, private sector, nonprofits, have to make some sacrifices so that those kids are getting an opportunity. And if you talk to the average person, they embrace that idea. One of the great things about being president is you get to meet people from all walks of life. And … people are fundamentally good people. And they want to do the right thing. And if you ask them should every child have an opportunity, they will tell you yes. But, if you tell them okay, that may mean we’ve got to spend more tax dollars to provide them with better schools. And the teachers have to be paid more. And we have to make sure that they’ve got computer equipment in their schools, and arts and music programs aren’t a luxury, they’re something that helps that child thrive. Then people start saying well, you know, I’ve got my own bills to pay. And I moved into this good school district and I want to make sure that that school district maintains its advantages. And I’m not sure whether the money’s going to be well spent. We find all kinds of excuses why we don’t actually do it, move that agenda forward. And part of my goal, through things like My Brother’s Keeper, part of Michelle’s goal to – an initiative she’s got called Let Girls Learn, is to keep on creating more and more avenues where we as a society can have that conversation and actually move forward and do the right thing. If we do that, we’re not going to eliminate racism and prejudice entirely in this society. But what we can do is to greatly lessen how much it determines the life chances of people. And that should be our goal. 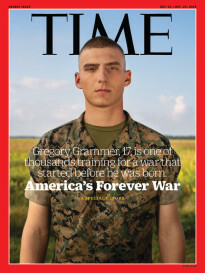 TIME: Great. Well thank you both so much for chatting with us. This has been really great. And lastly, did you guys catch the game on Saturday? Is Steph Curry the greatest, or is he just great? OBAMA: Steph Curry is the greatest shooter that I’ve ever seen. You knew I had an opinion on this. And, and I am having more fun watching him than anybody since Michael Jordan. TIME: I was going to ask, is he better than Jordan? He’s pretty remarkable. OBAMA: He’s not – even Steph wouldn’t necessarily say he’s better than Jordan. But he’s – the fact that he’s about my size and he’s doing what he’s doing. COPELAND: And I think the growth has been tremendous, I can imagine where he’s going to go. OBAMA: It is, that’s a great point. It’s rare where you get somebody who’s already at the pinnacle and then they take it another notch higher. And he’s a wonderful young man. He’s a lot of run. OBAMA: It’s great to see you. Thank you, I enjoyed it.